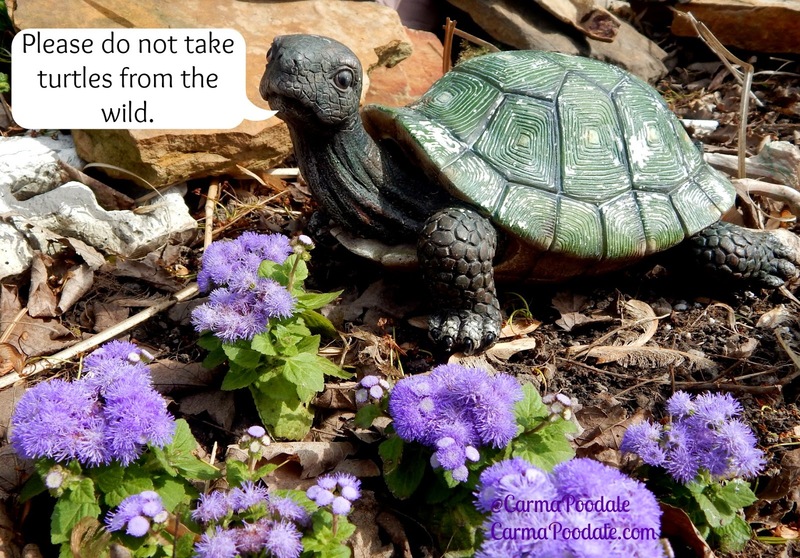 Carma Poodale : World Turtle Day!! This day was designated to bring awareness to tortoises and turtles by the American Tortoise Rescue in 2000. The American Tortoise Rescue is a 501(c)3 organization located in Malibu, Ca. We don't have turtles. Sissy Sarah has always wanted one but considering her aquarium fish have always ended up in the big aquarium and her gerbil ended up in the room with the guinea pig, ma didn't want to take care of a turtle. Turtles like to eat fish and ma really loves her fish. No turtles for sissy! So what did ma do to make sissy happy? She bought turtle statues! We have 3 turtle statues, they don't need a lot of care, they won't eat the fish and ma doesn't have to clean turtle tanks. Its a win win! 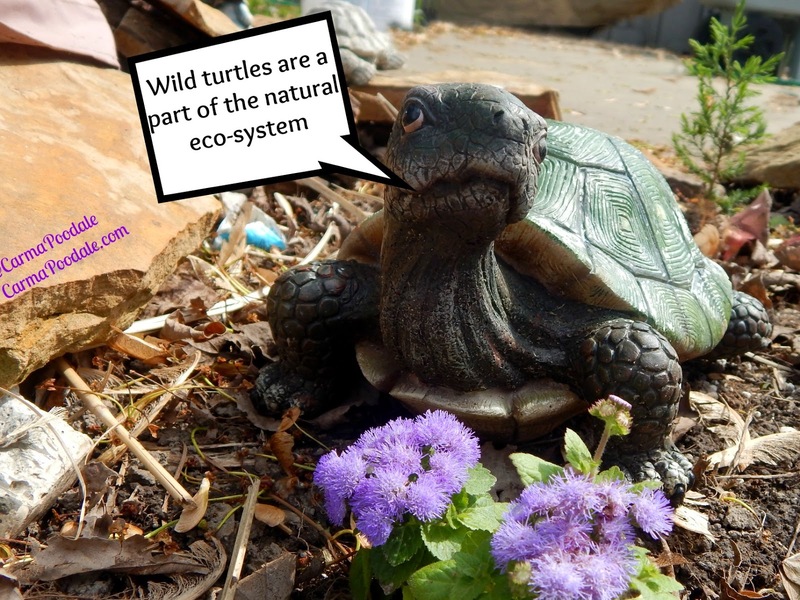 We love turtles but we know they take a lot of care and we know never to take them from the wild. Turtles that you find out in nature can carry diseases that don't hurt them but can make humans sick like Salmonella. Turtles also have been around since the dinosaurs. They have evolved through time. When mating season comes around, turtles return to their roots. Whenever you remove a turtle from its natural habitat it can stress them out and some will die from that stress. 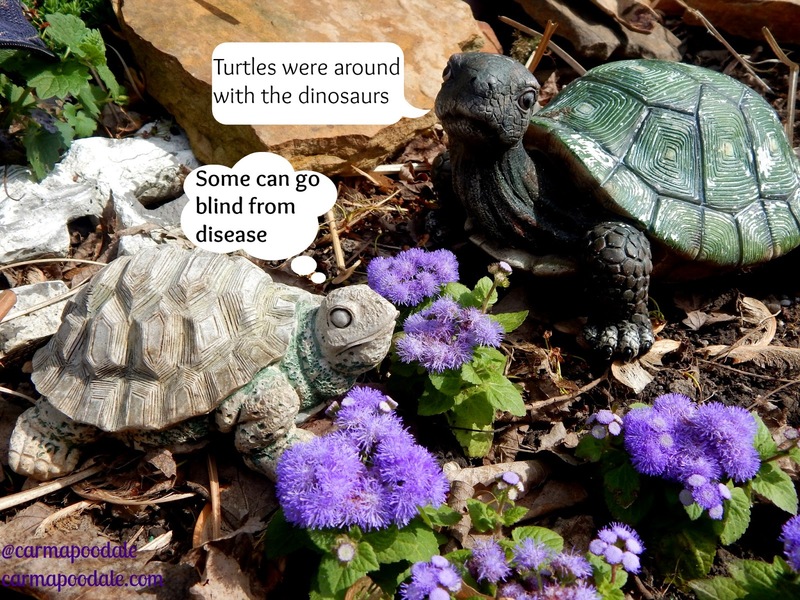 Some turtles can get eye diseases that cause them to go blind. Some turtles can spread diseases to other turtles and that itself can kill out a whole species of turtle. 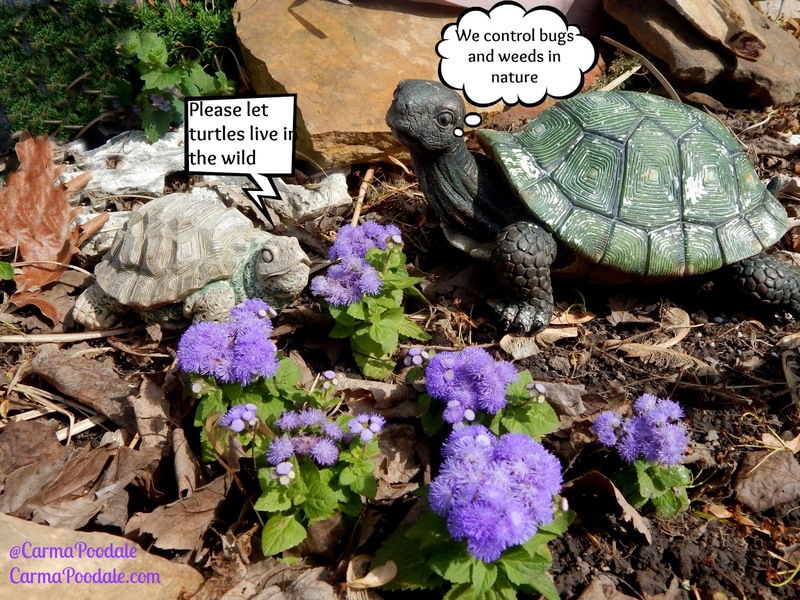 Turtles in ponds or rivers help to keep down water weeds and bugs. When you remove that turtle you are removing natures' pest repellant. You also remove all the turtles that can come from that turtle. Turtles will attempt to find their way back to their natural habitat. Turtles also eat the dead fish or the weaker fish. This helps to keep the fish healthy. Many turtles taken from the wild will never be able to adjust and they will die. Before you buy a turtle at a pet store , check to see the care that is needed for a turtle and remember turtles can live anywhere between 10 yrs - 200 yrs old. It depends on the species of turtle. Research on books or the internet on turtle care, make sure you have the right environment and you have the time that it takes for a well balanced turtle. Check you local shelters because sometimes turtles get surrendered or find a turtle rescue near you. 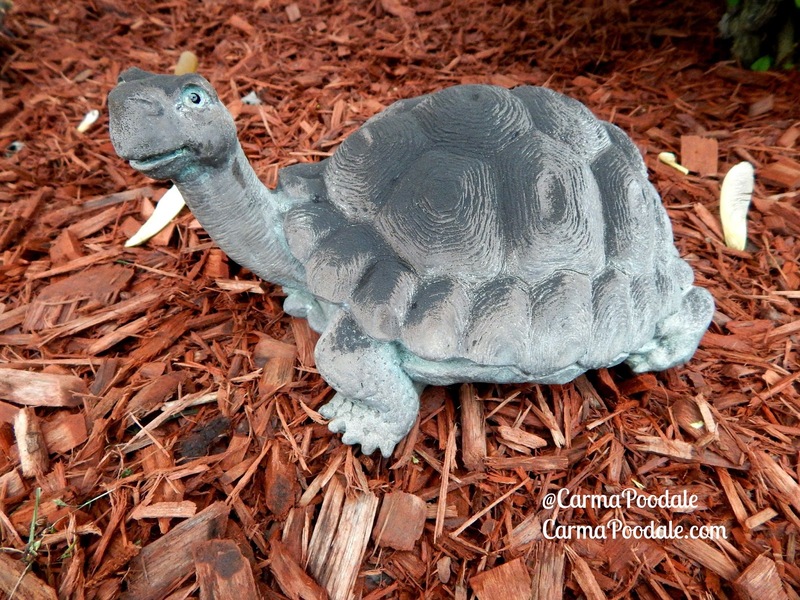 If you or your child wants a turtle but you are not able to take care of it do like we do and get a turtle statue! There are some really cute turtle statues out there and they won't bite your finger. Find more information about turtles at the following websites. Great post Carma! I used to work with a turtle vet and we did all kinds of cool stuff to turtles. We put a feeding tube in one a few times (it came out every now and then) and he had his tube for well over a year. Not all of 'em eat the fishies! There are some that are vegetarians too. Thanks for adding that they all don't eat the fish. I should have made that more clear. That is so cool that you were able to help a turtle vet!! I adore turtles.. helped save a couple of them when they were crossing a road. I actually have some of them living around me as I've seen them twice in the half dozen years we've lived there..